Pawhut’s Rabbit Hutch with sloped ramp is ideal for small animals such as rabbits and guinea pigs. 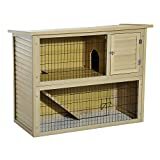 This 2-story rabbit hutch includes WPC construction that is both stable and aesthetically pleasing. The top can be opened for easy access making cleaning a breeze. A ramp connects the upper level and the lower level. The each level is surrounded with wire fencing and a wired door, making it incredibly easy to take your pet in and out of the hut. This is the perfect house for your fury little friends.